Ovid has traced the downfall of Medea in Book 7 of his Metamorphoses, eventually taking her to the court of King Aegeus in Athens, whom she marries. He has one final story to tell us about Medea and her sorcery, which provides a link back to her saga, and forward to the next, more heroic figure of Theseus. In this brief bridge between the stories of Medea and Theseus which dominate Book 7, Ovid only hints at the early life of his new hero Theseus, the son of King Aegeus of Athens. I will therefore provide the background. Aegeus had been childless, but following the prophecy of the oracle at Delphi, the King of Troezen got him drunk and packed him off to bed with his daughter Aethra. She was instructed in a dream to leave Aegeus asleep, and to go to a nearby island, where she was also impregnated by the god Poseidon. Theseus, who is presumed to have been conceived that night, was thus considered to have double paternity, by god and man, a common qualification for the heroes of myth. Aegeus returned to Athens, after burying his sword and sandals under a massive rock. He told Aethra that when his son grew up, she should tell him to move the rock, as a test. If he succeeded, then he should take the sandals and sword as evidence of his paternity. When Theseus was old enough, his mother Aethra showed him the rock, and gave him Aegeus’ instructions. Theseus moved the rock, found the sandals and sword, and then undertook an epic journey overland to visit his father in Athens. a known device — the token of his race. from his devoted son’s confiding lips. Medea flees, never to be heard of again, leaving Aegeus to give thanks to the gods. Ovid then introduces Theseus with a short resumé of some of his accomplishments, such as the killing of the Minotaur and of Procrustes, which he will enlarge upon subsequently. Oddly, Ovid’s explicit and very visual tale has not proved popular among painters, who have preferred to show the earlier scene, of Theseus discovering his father’s hidden sword and sandals – equally visual, but only alluded to in this book of the Metamorphoses. Laurent de La Hyre (1606–1656), Theseus And His Mother Aethra (1635-36), oil on canvas, 141 × 118.5 cm, Szépművészeti Múzeum, Budapest, Hungary. Wikimedia Commons. 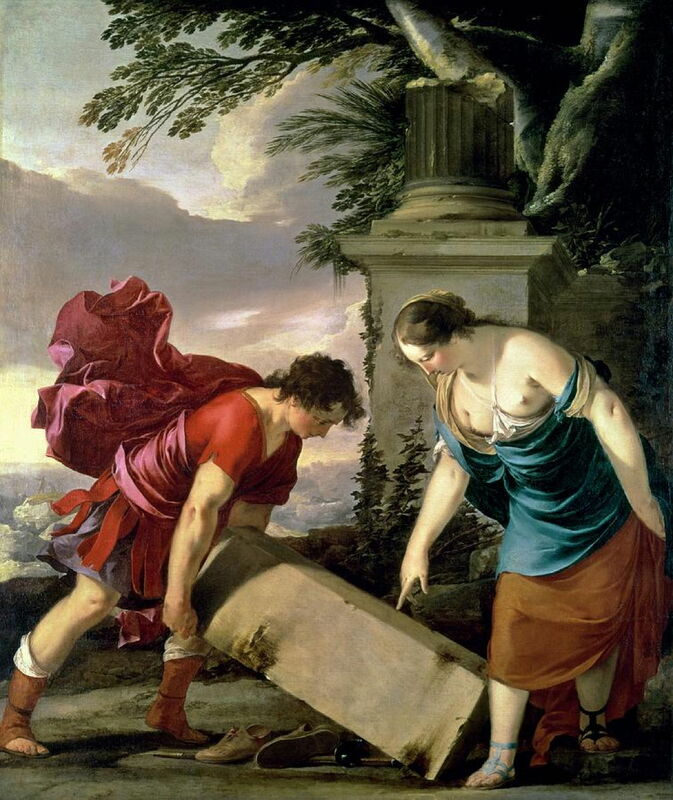 One of the earliest depictions is Laurent de La Hyre’s Theseus And His Mother Aethra (1635-36). This shows the young Theseus lifting a heavy pillar to reveal a pair of shoes and a sword. 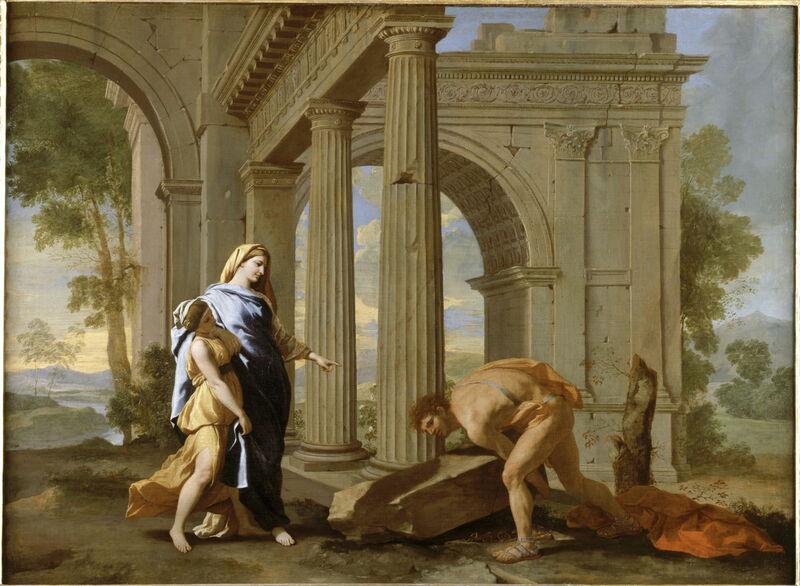 In one of his rare collaborative paintings, Nicolas Poussin worked with Jean Lemaire to show the same scene, of Theseus Recovering his Father’s Sword (c 1638). What I find fascinating here is the marked contrast between the two actors: Theseus, destined to be a great hero, looks quite rough and brutish, whilst his mother Aethra wouldn’t look out of place standing in for the Madonna, perhaps. 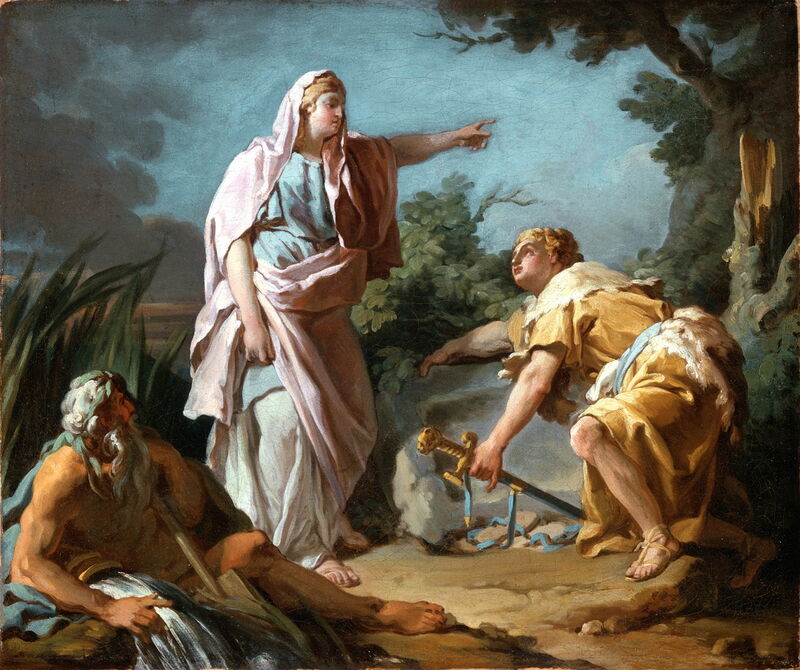 Nicolas-Guy Brenet’s rather more sketchy Aethra Showing her Son Theseus the Place Where his Father had Hidden his Arms (1768) adds a river god for good measure, and has Aethra giving Theseus marching orders to go find his father. Antonio Balestra (1666–1740), Theseus Discovering his Father’s Sword (c 1725), oil on canvas, 287 x 159 cm, Private collection. Wikimedia Commons. 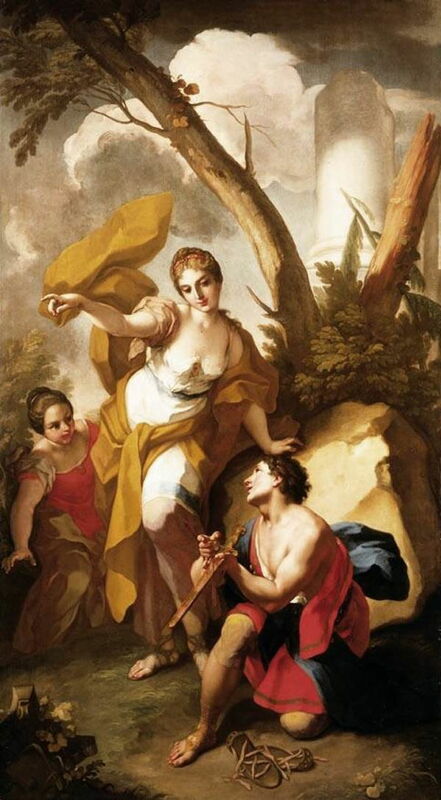 Antonio Balestra’s Theseus Discovering his Father’s Sword (c 1725) makes Theseus look a little less enthusiastic to follow his mother’s directions. Then in 1832, the theme chosen for the prestigious Prix de Rome (a competition for the best history painting by a young French artist) was the moment that Aegeus recognised Theseus, just before the latter swallowed enough aconite to kill himself. I have found two paintings which were contenders for that great honour. It was Hippolyte Flandrin’s Theseus Recognized by his Father (1832) which won the Prix de Rome that year, with its more neoclassical look which appears to have been influenced by Jacques-Louis David. 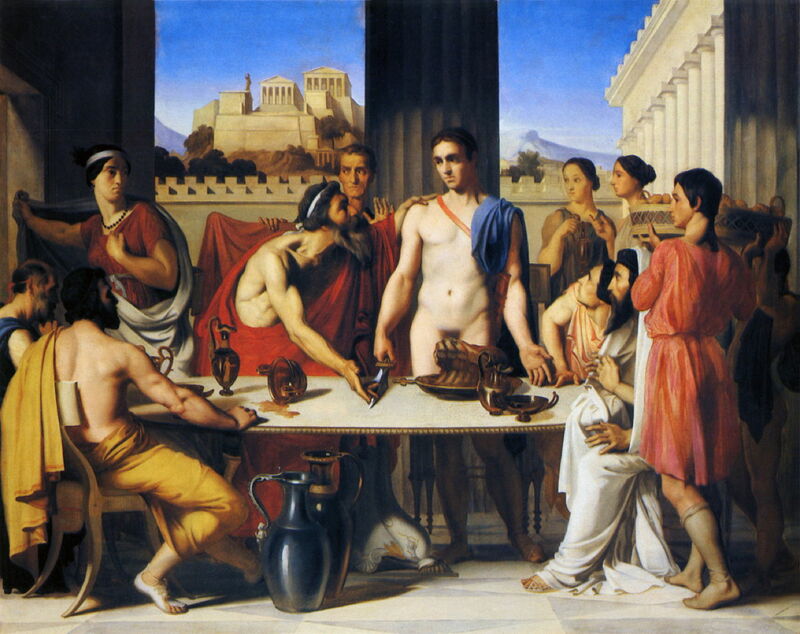 Flandrin establishes the scene as Athens, with a view of the Acropolis in the background. 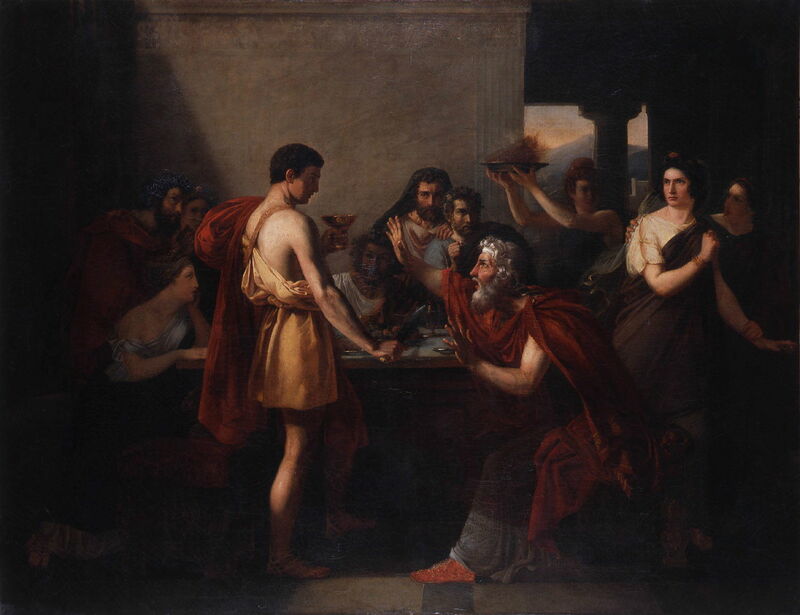 His timing is different from Gibert: this painting shows the moment immediately after Aegeus has recognised his son, and the cup of aconite lies spilt on the table; it is thus post-climactic. Theseus, conspicuously naked, stands in the middle of the canvas, his father’s sword held rather limply in his right hand. Aegeus stands to the left of centre, talking to his son quite emotionally. Sadly, although Gibert’s painting shows great promise, his work has now been almost entirely forgotten. Flandrin hasn’t fared much better, and is now best-known for two other paintings of male nudes. The myths of Theseus were, at one time, as popular as those of Heracles or even Aeneas or Jason. In about 1340-41, Giovanni Boccaccio wrote a very long (almost 10,000 line) epic poem Teseida, or The Theseid. This in turn inspired The Knight’s Tale in Chaucer’s Canterbury Tales. Paolo da Visso (1431–1481) painted these three scenes from Boccaccio’s epic on the front of a cassone – the visual equivalent of Ovid’s catalogue of the adventures of Theseus. Although thin on the ground, these are fine paintings which tell their stories well. Fortunately, as Ovid tells more tales from the myths about Theseus, most are covered better in the visual arts. Posted in General, Language, Life, Painting and tagged Balestra, Boccaccio, Brenet, Chaucer, da Visso, de la Hyre, Flandrin, Gibert, Medea, Metamorphoses, myth, narrative, Ovid, painting, Poussin. Bookmark the permalink.